Friends, I hope you have all been SPICING IT UP — your food and your lives! This is my original blend… we use it in our cooking all the time and I make lots of extra for friends. If you’d like to try it, or you are out of it and want some more, just let me know and I’ll happily send you more! We love to put a bit of olive oil on fish, shrimp or chicken and then generously coat them with the spices before grilling, baking or searing. My favorites are using it to blacken salmon or sear Ahi. Sometimes I even sprinkle it on a light, mild fish or shrimp before pan searing or baking it to give it more flavor. This blend has Aleppo Pepper, Black Pepper, Cayenne, Cumin, Garlic, Nutmeg, Oregano, Paprika, Salt, Sugar, Thyme and one secret ingredient. This seasoning is one we never grow tired of. For me it’s the perfect balance of spiciness (I love heat), saltiness, and it has a slight Middle-Eastern flare to honor my Armenian heritage. In addition to using it on fish, poultry or meats, you can sprinkle it on veggies, potatoes or eggs when baking, grilling or pan-frying. Try tossing your salad with olive oil and then sprinkling this on top (it’s much more wine-friendly than vinegar). And, sprinkle it on healthy snacks such as cucumbers, cottage cheese, fruit, or other fun snacks like popcorn and nuts! 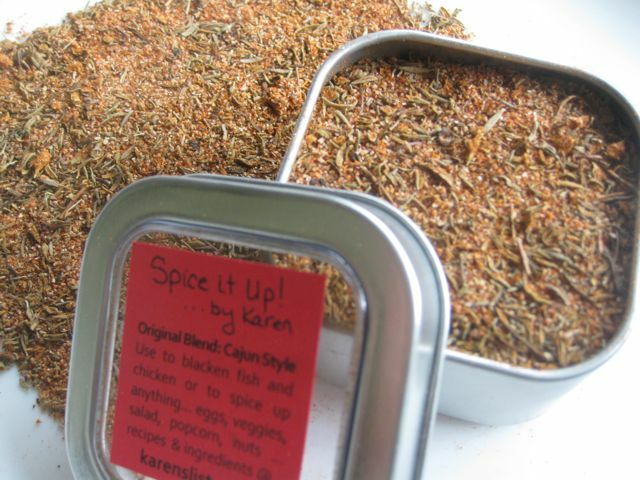 If you click on the “Spice it Up …by Karen™” link to the right under category search, you can scroll through various posts to see how I use it in my every day cooking and snacking. The rest of this site is a place for me to keep track of my favorite recipes and share them with friends. 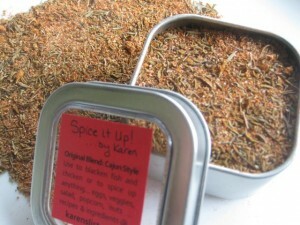 This is another fun spice blend I created last year. It was inspired by a recipe given to me by my mom for one of her favorite shrimp dishes. 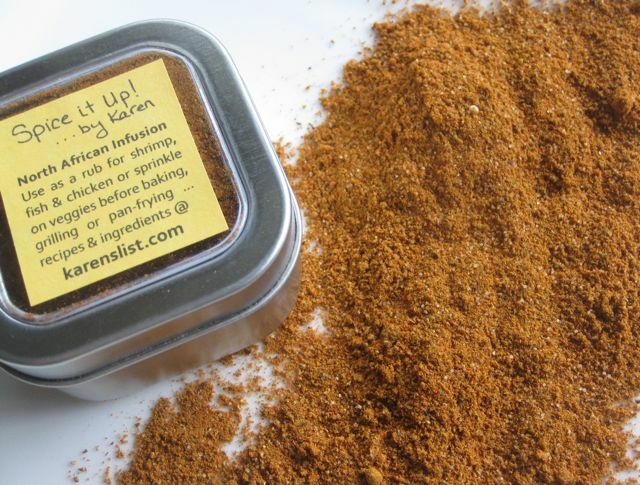 I’m calling it North African Infusion – it includes Black Pepper, Cardamom, Cayenne, Chile, Cinnamon, Coriander, Cumin, Ginger, Paprika, Salt, Turmeric and one secret ingredient. It has less “heat” than the original blend, but lots of flavor. You can also use the spice to create a marinade. For 1 to 1 1/2 pounds of cubed chicken, mix together 1/2 cup of yogurt, 2 tablespoons of olive oil, the juice of one lemon, 3 tablespoons of spice, (and optionally some fresh ginger and garlic). Marinate for 6-8 hours or overnight. Skewer and grill. Before serving, drizzel with lemon juice and sprinkle with mint or parsley. Please drop me a note, with your address, if you’d like me to send you some spice – karen@karenslist.com.